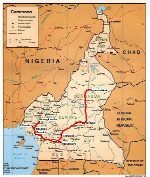 Si vous avez l'intention d'aller photographier les chemins de fer (ou quoi que ce soit d'autre ) au Cameroun, lisez d'abord cet AVERTISSEMENT ! Falls Sie Eisenbahnen (oder irgend was sonst) im Kamerun fotographieren wollt, liest zuerst diese WARNUNG ! If you want to photography the railways (or anything else) in Cameroon, please read that WARNING first ! Un petit peu de tourisme? Cliquez ici! Ein Bisschen Turismus? Clickt hier! A little bit of tourism? Click here! THE main line of the Camrail. The first part as far as Eséka has been built by the german colonial administration, the rest to Yaoundé has been finished by the french administration. Quite few passenger traffic (daily 3 trains, the ICs have usually only 3-4 coaches, and the "Shuttle" only one coach plus 2-3 covered goods vans) because of the totally uncontrolled concurrence of lots of bus companies, running oftly and faster (but also with much accidents!). The goods traffic is important, around 5 to 10 heavy trains daily. 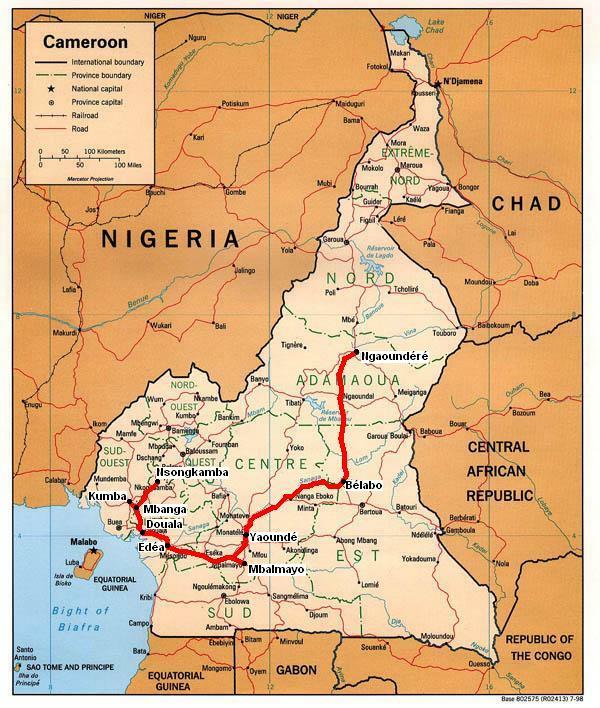 As the road network is much fewer developed north of Yaoundé, the passenger trains to Ngaoundéré are much heavier than in direction of Douala (10-12 coaches) There are local trains on Yaoundé-Bélabo. Goods traffic like Yaoundé-Douala. Ligne mise en service en 1911 par l'administration coloniale allemande ("Manegubahn", initialement seulement Bonabéri - Nkongsamba). Seul le troncon Douala - Mbanga est en service, avec tres peu de trafic (principalement à cause de l'état du pont combiné rail - route sur le Wouri, à Douala). Strecke 1911 von der deutschen Kolonialverwaltung als "Manegubahn" (ursprünglich nur Bonabéri - Nkongsamba) gebaut. Nur der Abschnitt Douala - Mbanga ist noch im Betrieb, mit sehr wenig Verkehr (vor allem wegen der schlechten Zustand der kombinierten Bahn / Strassenbrücke über der Wouri, in Douala). Auf Karten, die noch vor 1918 angefertigt wurden, ist ein nicht realisiertes Projekt einer Verlängerung Richtung Norden nach Bafoussam, Foumban, Banyo und Garoua sichtbar. Line opened in 1911 by the german colonial administration ("Manegubahn", initially only Bonabéri - Nkongsamba). Only Douala - Mbanga is in service, with very few traffic (mainly because of the bad state of the combined road-rail bridge over the Wouri river, in Douala). Autorails doubles construits par Alsthom en 1976 pour les chemins de fer portugais CP (type 9600) et rachetés d'occasion. Ils effectuent les services IC entre Yaoundé et Douala. Doppeltriebwagen, von Alsthom 1976 für die portugesische Staatsbahnen CP (Typ 9600) gebaut, und von der Camrail als Okkasion gekauft. Sie sind bei den ICs Yaoundé - Douala eingesetzt. DMUs built by Alsthom in 1976 for the protuguise railways CP (type 9600) and bought 2nd-hand by Camrail. They are used for the IC services Yaoundé - Douala. Locomotives de manoeuvres, fabrication Moyse. Une seule reste en service (1039, manoeuvres à Douala) mais radiation prévue à la prochaine avarie. Rangierlokomotiven, gebaut bei Moyse. nur noch 1 im Betrieb (1039, Rangieren in Douala), aber beim nächsten Schaden wird die ausgemustert. Shunters built by Moyse. only one remaining in service (1039, shunting in Douala), but will be taken out of service at the next damage. Locomotives fabriquées par Alsthom / MTE, utilisées pour les manoeuvres et les trains de voyageurs légers sur Douala - Yaoundé et Yaoundé - Bélabo. Lokomotiven gebaut von Alsthom / MTE, für Manöver und leichte Personenzüge Douala - Yaoundé und Yaoundé - Bélabo. 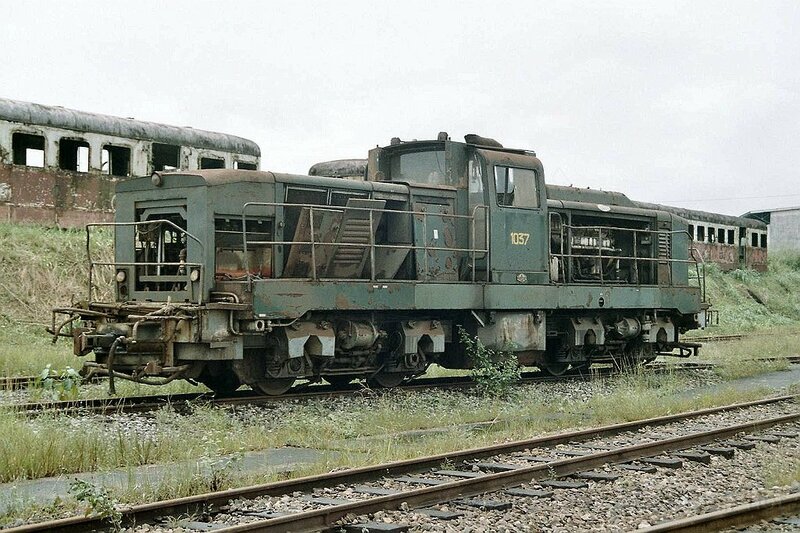 Locomotives built by Alsthom / MTE, used for shunting and light passenger trains on Douala - Yaoundé and Yaoundé - Bélabo. Alsthom-Loks, ähnlich zu vielen Loks, die um 1960 an diversen "Kolonialbahnen" sowie Holland (Typ 6500 der NS) geliefert wurden. Nur 1210 ist noch im Betrieb in Douala. Locomotives Alsthom, quite similar to those delivered around 1960 to some "colonial" railways and also to the netherland state railways (type 6500 NS). Only 1210 is still in service in Douala. Locomotives construites par Bombardier (Canada), type MLW MX 620, assurant le trafic marchandises sur Douala - Yaoundé - Ngaoundéré, plus le trafic voyageurs sur Yaoundé - Ngaoundéré. Lokomotiven gebaut von Bombardier (Kanada), Herstellertyp MLW MX 620: Güterverkehr Douala - Yaoundé - Ngaoundéré, plus Personenverkehr Yaoundé - Ngaoundéré. 8 locomotives construites par NREC (E3200-CUN) en 2012. Assurent les mêmes services que les CC 2200. Lokomotiven gebaut von Bombardier (Kanada), Herstellertyp MLW MX 620: Güterverkehr Douala - Yaoundé - Ngaoundéré, plus Personenverkehr Yaoundé - Ngaoundéré. 5 locomotives fabriquées par EMD, type GT26M2C, rachetées aux chemins de fer sud-africains Spoornet (Ancienne immatriculation: série 35 de la Spoornet). Assurent les mêmes services que les CC 2200. 5 Locomotives gebaut von EMD, Herstellertyp GT26M2C, von den Südafrikanische Eisenbahnen Spoornet (Ehemalige Immatrikulation bei der Sopprnet: Baureihe 35) als Okkasion gekauft. Gleichen Dienste wie die CC 2200 5 locomotives built EMD, type GT26M2C, bought 2nd-hand from the south african railways Spoornet (Former immatriculation: type 35 of Spoornet). Same services like the CC 2200s. 2 locomotives construites par NREC (GT26CU / E3000-CUN) en 2009 (3300 CV, 102t). Assurent les mêmes services que les CC 2200. (Sorry, pas de photos...) 2 Lokomotiven, von NREC (GT26CU / E3000-CUN) in 2009 gebaut (3300 CV, 102t). Gleichen Dienste wie die CC 2200. 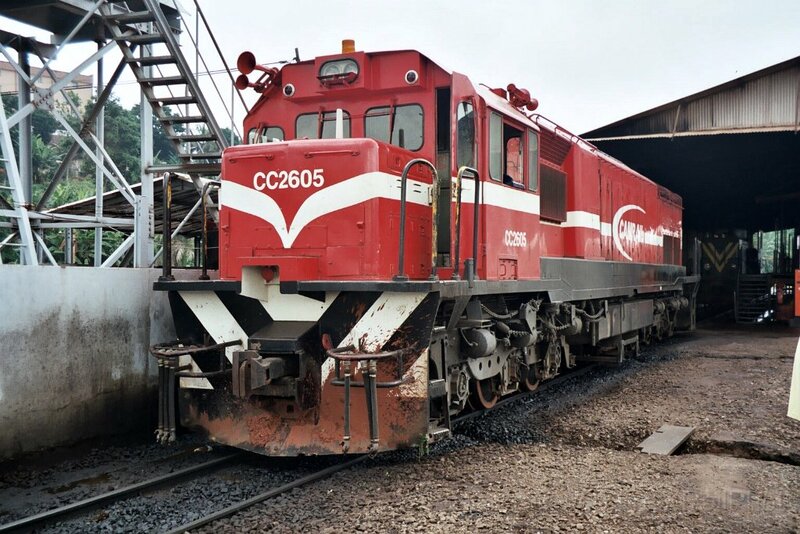 2 locomotives built by NREC (GT26CU / E3000-CUN) in 2009 (3300 hp, 102 tons). They are used in the freight service like the CC 2200s.